Short sharp kick in the teeth: # 345 This Kids - Let's have fun ! 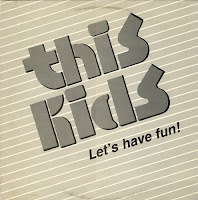 # 345 This Kids - Let's have fun ! "This Kids" were from Oceanside/California and i don't know if this was their lone release. We have here 5 okay powerpop tracks and a boring rock'n'roll number. I haven't found infos about this group.